This sunny and modern apartment Ostseeblick-Rerik in the apartment complex 'Am Salzhaff' C4 is in the former fishing village Rerik between the Hanseatic cities of Wismar and Rostock. From the apartment you can enjoy a fantastic panoramic view over the Salzhaff with its beautiful harbor and the beach promenade. The ground floor accessible apartment on the mezzanine floor is located in the center of Rerik and all shops, restaurants and the beach are just minutes away. Fresh rolls are in the cafe just around the corner. A sailing school, boat rentals and a passenger ship lying at the door. Bicycles can be rented at the bike shop (100 m). Nice bike / walking paths and direction Kühlungsborn and complete the recovery in Haffnähe program. Information will be provided for you at the apartment. Beach vacation: The Rerik inspired by its location on Salzhaff and the Baltic Sea. The well-kept beach of the Baltic Sea Rerik is minutes (150 m) from the apartment. The Salzhaff with its grass / sandy beach is just around the corner. There you can swim and enjoy the sun and wind at the Baltic Sea from the beach chair out. A dog beach can be reached in 250 m. The generous pier is also within 150 m .From there you can choose from to experience a beautiful sunset or enjoy the beach by the sea side. From the ice on the hand or a delicious fish sandwich at the beach you do not need to dream. Ice and restaurants near the beach leave nothing to be desired. For those who like it quiet, invite foot in the direction of Kuehlungsborn, by bike or car to reach other beaches a. And a nudist beach (250 m) there are. Culinary: Rerik has a very good cuisine. Directly into the immediate vicinity you will find several restaurants with a variety of fish and meat offerings. The fish dishes are often seasonal - and supply-dependent - come so fresh on the table. Secluded terraces directly to the lake or the lagoon make culinary feast and great sunsets together possible. From rustic to elegant, everything is alive. An information about restaurants, see the apartment. We are happy to inform you personally. Leisure Pass: you cycle like? Then you are right with us. From Rerik you reach next resort of Kühlungsborn 12 km and other seaside resorts further away. The routes are well marked and passable. Again and again, you'll go the most magnificent views of the Baltic Sea or the hilly landscape. The pure driving pleasure. In case you do not have your own bicycle with you, rent a bicycle hire the right bike to you. A bicycle storage room and parking spaces in front of the house are available, a bicycle map in copy is included in the apartment ready for you. If you prefer to walk, Rerik offers you a variety of marked hiking trails. There you will experience nature in all its beauty, and every season. Viewing platforms and information panels invite you to linger. About guided themed walks, you can inform the next door spa. Wir sind Mitte März zu zweit angereist. Auch wenn das Wetter nicht richtig mitspielte, haben wir unseren Aufenthalt sehr genossen. Das Apartment war sehr sauber, die Kommunikation mit Verwaltung und Eigentümer einwandfrei! Die Wohnung bietet ausreichend Platz, auf dem Sessel hat man einen atemberaubenden Ausblick auf das Salzhaff, und ob morgens am Frühstückstisch oder abends im Bett, der Ausblick lässt sich im gesamten Sortiment genießen. Auch ist Rerik sehr zentral gelegen, Bad Doberan, Kühlungsborn und auch Warnemünde befinden sich in der 30-Min. Erreichbarkeit. Ausflugsziele gibt es genügend, also immer einen Urlaub wert! Sehr schönes Appartment. Tolle Lage mit Haff-Blick. Sehr gut ausgestattet für 1 bis 2 Personen. Absolut empfehlenswert. Nette und freundliche Verwalterin. Sauberes Apartment, zuvorkommende und unkomplizierte Vermieterin. Alles gut. Sehr schön, wenn auch klein. Sehr netter vermieterkontakt. Handtücher sollten an sich gestellt werden, waren nicht da. War aber nicht dramatisch, daher hätte ich das auch nicht gemeldet. Holiday complex on Salzhaff - Apartment C4. in the holiday apartment complex on Salzhaff, Liskowstr. 2 in Rerik. about 150 meters from the Baltic Sea beach, 25 meters to the Salzhaff. 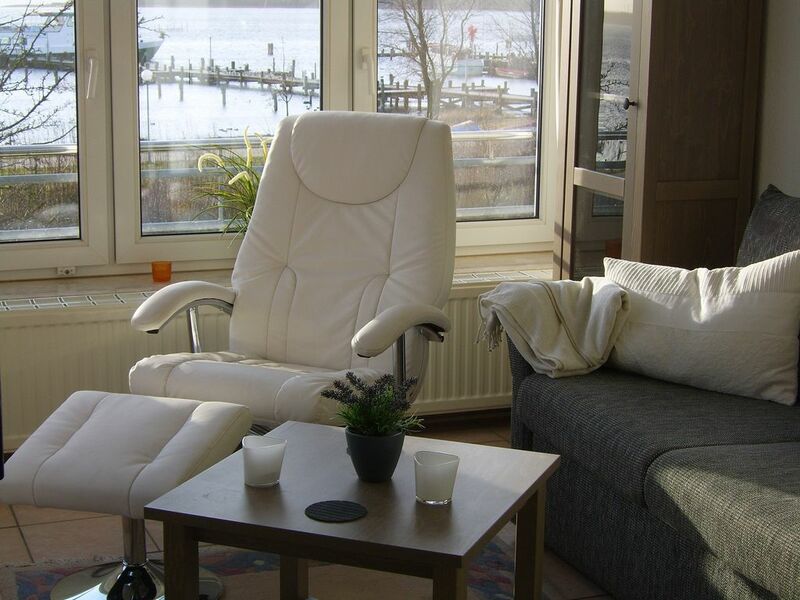 The apartment is centrally located in the small Rerik, right on Salzhaff with its beautiful harbor. A bakery where you can have breakfast and the spa are within walking distance. All shops are within walking distance. Rerik offers the tourists a neat sea beach with beach chairs and a pier. In addition, many attractive holiday activities for young and old are offered. Inviting restaurants spoil their guests with delicious fish dishes as well as various other delicacies. A bicycle rental is located in the neighborhood, and a shop for fishing. The closest Kuehlungsborn is 10 km away and easily accessible by bike or by car. Rostock and Wismar about 30 km away. Directly on the Baltic Sea, between the traditional seaside resorts Heiligendamm and Kühlungsborn, lies the Baltic Golf Resort Wittenbeck. The 18-hole championship course Eikhof with its exceptional space architecture provides a major challenge for ambitious golfers and the 9-hole compact course courtier is an ideal place for beginners. Also popular are the entry-level and advanced courses and the introductory training in the golf school. The mild maritime climate, the vast Baltic Sea beach, the woods and hiking trails promise rest and relaxation. One of the most beautiful golf courses in Germany is looking forward to your visit.